KBShimmer - Mega Flame Collection - Polish Etc. I have the other half of the KBShimmer Spring collection for you today. This half is called the Mega Flame Collection and consists of 7 super blingy polishes in a rainbow of colors. At first glance, you may think it looks similar to the Birthstone Collection but it is different. 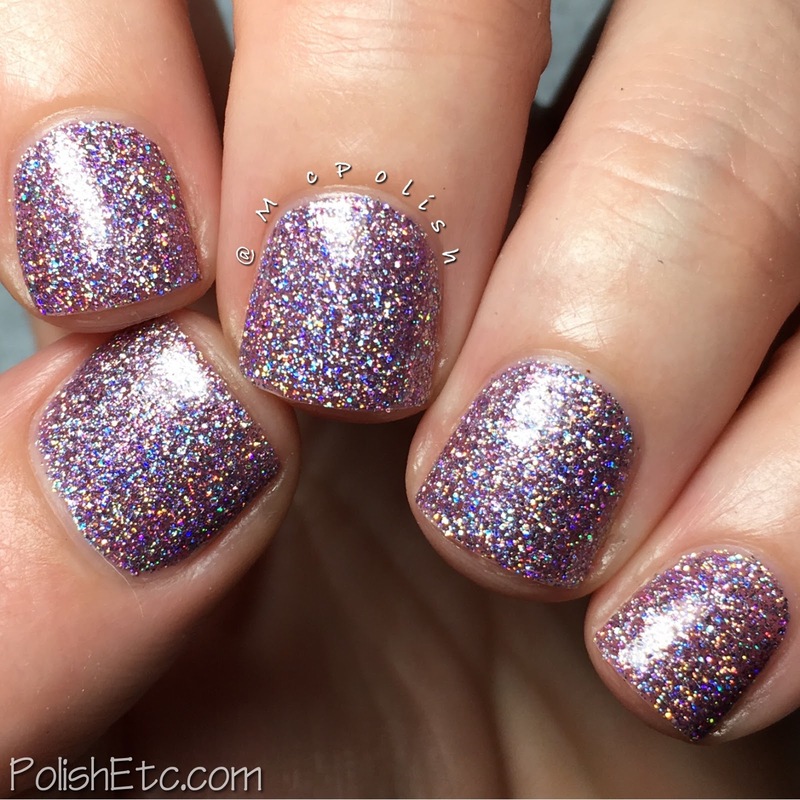 These polishes have more of a jelly finish that is jam packed with holographic microglitter. These polishes released this Spring but are definitely not just for Spring. They can be worn year round and there is a color for everyone in here. I really, really like this set! These are available now, so no need to wait around. Go over to the site and snag your faves right away. Let's take a look at all of the sparkle! Click through for lots of photos! I am going to start with my favorite, "So Flamous". Of course this one would be my fave of the collection, it's orange! 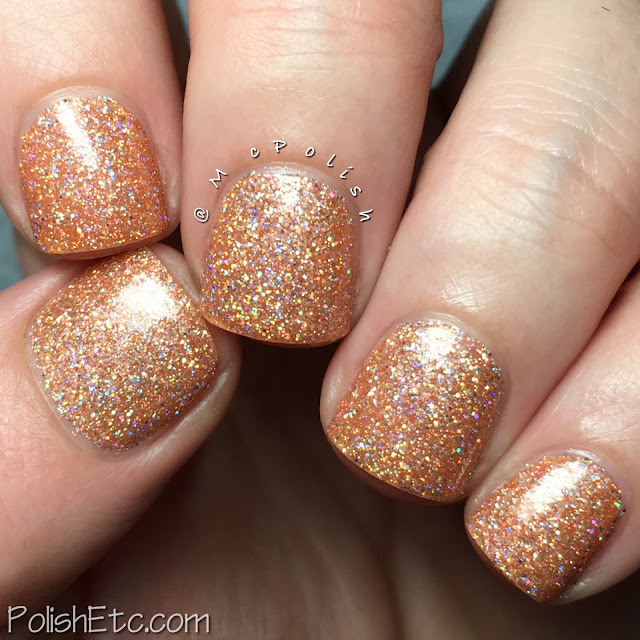 "So Flamous" is a muted peach toned orange with silver holographic microglitter. The flash of the holo rainbow through the orange base gives it a golden flash. This was two coats topped with Clearly On Top. You would think that this would dry gritty because of all of the glitter, but it was pretty smooth with the top coat. That is true for all of the polishes in this collection. I am so in love with this color! "Smells Like Green Spirit" has a bright, grass green jelly base that is packed with silver holo micorglitter. This, too, has a little bit of a golden flash from the holo under the green. The coverage was very nice and I used two coats with Clearly On Top to seal it off. 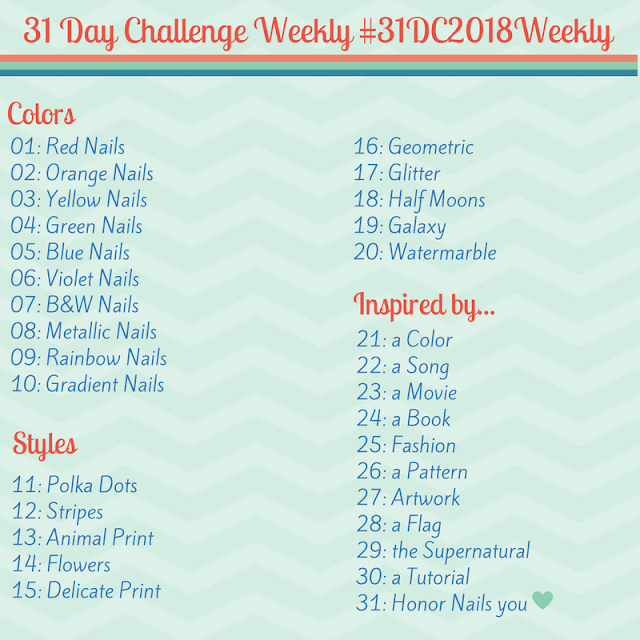 If you love green polish, you will love this one! "Stalk Market" has a yellow jelly base that has a touch of chartreuse mixed in. It has the same silver holographic microglitter that makes it shine like gold. The yellow is not as bright as Citrine from the Birthstone Collection which makes it perfect for springtime. This is two coats with Clearly On Top. I was happy with the coverage but some people with longer nails may like a third coat. If you love a chic black mani but want a little bit of extra sparkle..."Night Bright" is for you! This has a black jelly base that is quite opaque but it does not dampen the sparkle of the silver holo glitter mixed within. It is a stunner! I used two coats with Clearly On Top as my top coat for this swatch. "Ripe for the Pink-ing" is a bright berry pink jelly packed with the same mix of silver holo microglitter. This one is for all my girly-girls out there. It is quite opaque in just two coats and very sparkly. "Things That Make You Go Bloom" is the palest color in the collection. 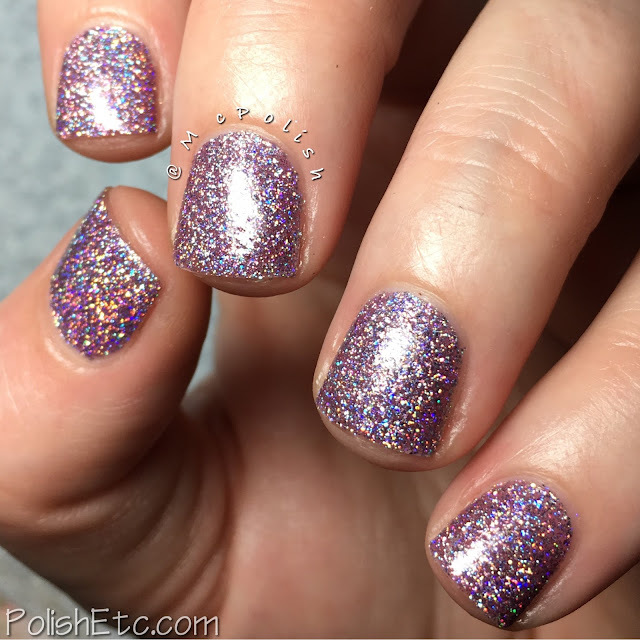 It has a pale lavender jelly base with the same super sparkly holo glitter. Everyone needs a pastel purple on their nails in the Spring, why not have it be super glittery? Even though this color was pale, it still was opaque enough for me in two coats. Again, some people may prefer a third coat. Lastly, we have a bright cerulean blue jelly with sparkle called "Set in Ocean". There is so much silver holo glitter in there it is hard to see the jelly base! Again, the formula was great and I only need two coats for full opacity. It is all topped off with Clearly On Top. The KBShimmer Mega Flame is available now! I think every one of these polishes is worth having but if I had to pick favorites it would be So Flamous, Smells Like Green Spirit and Night Bright. They sell for $9.25 a piece on the KBShimmer online store. Have you gotten any of these glittery beauties? If so...which ones? I got my picks last week and I love them! :) Your pics are gorgeous as ever. SO...MUCH...GLITTER! Love this collection, great photos!